Based on the principle that prevention is better than cure, our fully trained and experienced nurses offer a range of clubs and clinics, free of charge, designed to help your pet lead the healthy life they deserve. Weight Watchers for pets! You want your pet to enjoy the best quality of life possible, but if they are overweight this can have an adverse effect on their mobility and general wellbeing. They can become lethargic and even be prone to conditions such as heart disease, arthritis, diabetes and breathing difficulties. Our nurses will devise a personalised exercise and nutrition plan to shed those pounds, followed by regular updates about your pet’s weight. Take advantage of this free service and help your pet maintain a healthy weight. If you are concerned that your pet is overweight and would like a free consultation with one of our Qualified Veterinary Nurses call Kerry Coleyshaw RVN and Laura Watson RVN on 01902 731127. Behaviour advice for your pets! We want to ensure you and your pets live a happy and harmonious life. If you have any behavioural issues with your pets our nurses Amanda Finch RVN and Laura Watson RVN will be happy to help. Dental advice for your pets! 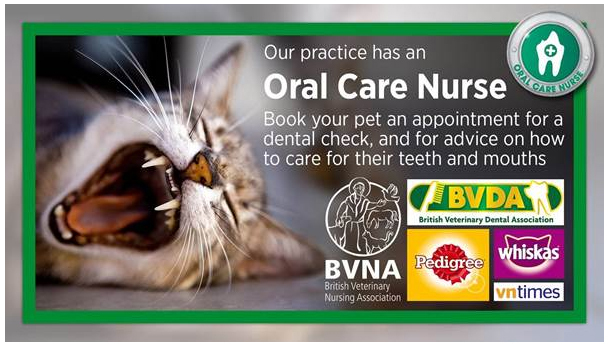 We have a BVNA Oral Care Nurse in practice whom performs oral care clinics to discuss oral health, oral preventative measures and identify pets that require oral care attention. If you would like to book an appointment please contact Laura Watson RVN.